Rev. Leonard E. Craft is the fifth child born to the late Rev. John W. Craft Sr. and Sis. Myrtis B. Craft. He is married to Sis. Shirley Nichols Craft and they have five children and three grandchildren. Rev. Craft was called to preach the gospel in May of 1992 under the leadership of Rev. 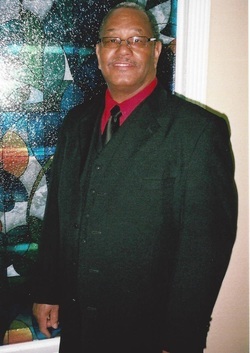 Gerald Cheatham at Tabernacle Baptist Church in Slidell, LA. He was educated in the St. Tammany Parish School System. He graduated from Salmen High School in 1975 then continued his studies at Southern University in New Orleans where he earned a Bachelors of Science degree in Accounting. He later attended Union Baptist Theological Seminary in New Orleans, and in June of 1994 he received a Master of Theology Degree from Christian Bible of Kenner, LA. Rev. Craft felt the need to continue his religious education and in May of 1998 he received a Doctor of Theology Degree for studies completed at Christian Bible College of Greater St. Tammany. He currently serves as an instructor at Christian Bible College and is still reaching higher, he realizes that there is a lot more that God has for him to do. Through the years, many souls have been saved through the teaching and preaching ministry of Rev. Craft. He is a mentor to eight associate’s ministers at Macedonia and several other Pastor/Ministers in the Slidell and surrounding area. To everything he gives God all the “Glory”.